digg_url = ‘//www.fastcompany.com/blog/gina-trapani/work-smart/five-browser-secrets-power-web-surfers’; digg_skin = ‘compact’; Whether you’re working or wasting time, you spend a lot of time on the Web every day. But are you using your browser’s best features? Whether you’re working or wasting time, you spend a lot of time on the Web every day. You’ve already ditched Internet Explorer and switched to Firefox or Chrome; in fact, Net Applications’ browser marketshare stats show Chrome inched past Safari for the first time in December to take the No. 3 spot behind IE and Firefox. But are you using your browser’s best features? Power Web surfers know the settings and shortcuts that make getting what you need online fast and efficiently. Here are five browser tricks that can streamline your surfing session, whether you’re on Facebook or the company intranet. Set multiple tabs as your browser home page. The days of a single default home page are over. If you always get on the Web to check the same Web sites–like Gmail, Facebook, FastCompany.com, and Google Reader–save yourself the time of visiting them by hand, and set all of them to load automatically in tabs when you start your browser. 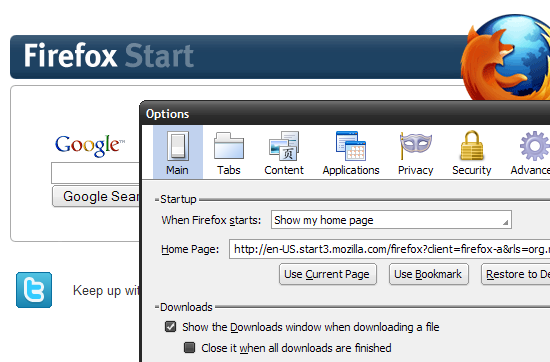 To set this up in Firefox, open only the tabs you want to load when you start, and from the Tools menu, choose Options. Under Startup, in the Home page setting, click the “Use Current Pages” button to set those tabs as your home tabs. In Chrome’s Options you can do the same. Open a link in a background tab by clicking your mousewheel. When you’re browsing blogs, news, Twitter, or Facebook you come across links you want to check out, but you don’t want to stop reading your current page. If your mouse has a wheel on it, click links of interest with the mousewheel to open links in background tabs as you read down a page, so you can switch to them later without interrupting your flow now. An extra tip for mousewheelers: Close background tabs in one click of the mousewheel without switching to them first, too. Sync your bookmarks across browsers and computers. When you save a bookmark at work you want it in your list at home and vice versa, and bookmark synchronization is available in both Firefox (with an extension) and Chrome. To sync your bookmarks across many different browsers, try the Xmarks extension, which works with Firefox, Chrome, Safari, and even Internet Explorer. Once you’ve installed the extension, you create a free Xmarks account, and sync your bookmarks (and optionally your Web site passwords) to Xmarks, which then downloads them to any other computer or browser with Xmarks installed. If you’re a dedicated Chrome user, bookmark syncing comes built in, no extension required. From Chrome’s Tools menu, choose “Synchronize my bookmarks.” Sign into your Google account, and Chrome will save your bookmarks into a Chrome folder in your Google Docs account. These five tips just scratch the surface; next time we’ll tackle one-stop search engines and your smart address bar. In the meantime, what is your most-used, indispensable browsing trick?